Moncrieff has worked with scores of clients, which is why we understand that no two organisations are the same. Each organisation has different requirements and needs different types of applications. 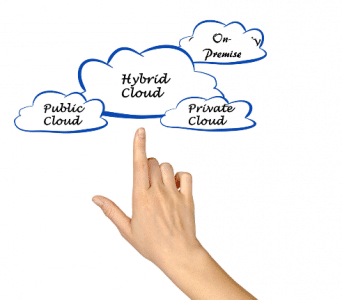 Our hybrid cloud storage solutions combine on-premise, public and Moncrieff Private Cloud. Moncrieff Private Cloud provides a transparent extension of private cloud workloads to public or third-party provider-hosted cloud environments via Cisco Intercloud Fabric. Hybrid cloud connections are highly secure and deliver flexibility for workload placement. Network security and access control policies defined within a private cloud are enforced in the public cloud, ensuring secure elastic cloud capacity. Contact us today to find out more about our hybrid cloud services. Hybrid cloud storage is an approach to cloud storage that leverages the benefits of both private and public cloud storage, using local and off-site resources. This means that you can effectively store data on one cloud and the rest on the other. The choice of location for the data will depend largely on its importance, use and your bandwidth need. As part of the Hybrid Cloud Solution, the Moncrieff Private Cloud accommodates supply and demand economics for the provision of IT workloads in the public cloud. The system can prepare, provision and de-provision workloads in and out of the public cloud based on increases and decreases in demand for resources. With IaaS subscription using the Hybrid Cloud Solution means only paying for the compute capacity required.